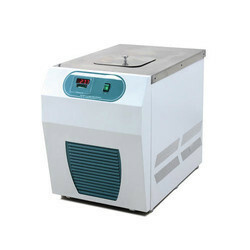 Leading Manufacturer of refrigerated circulating water bath, constant temperature water bath, shaking water bath, digital serological water bath, digital shaking water baths and thermostatic acrylic water bath from Chennai. 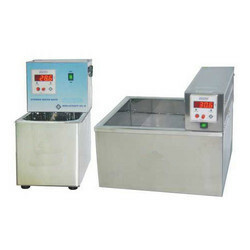 We are well known Suppliers of Refrigerated Circulating Water Baths in India. Our Refrigerated Circulating Water Baths are widely used for day to day General laboratory Cooling in various laboratory applications. We specialize in both standard and customized models with CE Marked, specifically designed to meet the specific demands of various scientists for individual and specialized research applications. Apart from that we are supplying our Refrigerated Circulating Water Baths in India through dealers catering to a variety of customers ranging from Atomic energy, Biotechnology Companies, Microbiology Laboratory, Pharmaceutical Manufacturers, Defence Installations, Research Laboratories, Educational Institutes and various Research and Development laboratories of leading national and multinational companies. This Refrigerated Circulating Bath provides heating and cooling. Extremely compact single table top - saves bench and under-table space. Eliminates all the unwieldiness and hassles of using a separate Bath & Chiller. Built in circulator, pumps to external devices. It offers highest level of performance, flexibility and control for the most demanding applications. Quiet operation, Wide operating range. Ideal for Rotational Viscosity tests, Spectrophotometers, Refractometers, Electrophoresis, Isoelectric Focusing, Calibration, Chromatography, Condensers, Densitometers, Polarimeters and General Laboratory Cooling. Crevice free stainless die pressed vessel, Stainless steel polished top. Temperature Range -10ºC to 120ºC. PID Temperature Controller with Soak Timer. Control Accuracy of ±0.1ºC for water and ±0.2ºC for oil. High Temperature safety cut-out - self revetting type. Excellent stirring enables uniformity better than 0.2ºC. Two bright LED Displays for process temperature and set temperature/time. Powerful external pumping @ 9.0 lit/min. Bath opening: 145 mm x 150 mm. Being an Quality Concerned Suppliers of Stirred Water Baths. Our Stirred Water Baths / Constant Temperature Water Baths are mostly & widely used for everyday Vacuum process methods in various Automated Pharmaceutical laboratories, Sophosticated Food Laboratories, Hitech Universities and for Research applications. We specialize in both standard, advanced, customized models with CE Marked, specifically designed to meet the challenging demands of various scientists / Research centers / individual and specialized research applications. Apart from that we are supplying ourTable Top Stainless Steel Water Stills & Stone Fin Water Stills in India through dealers , catering to a variety of customers ranging from Atomic energy, Biotechnology Companies, Microbiology Laboratory, Pharmaceutical Manufacturers, Defence Installations, Research Laboratories, Clinical Microbiology/Pathology/Biochemistry Laboratories, Educational Institutes and research laboratories, development laboratories, and test laboratories of leading national and multinational companies. Stirring achieved by an efficient, continuously rated, self cooling motor with SS shaft and propeller of anticorrosive material. biotechnology laboratory for development of culture applications and general laboratory work. Independent over-temperature self resetting safety cut-off with alarm. External Pumping @300ml/min at same level. Temperature 5 to 80 Degree C.
Shaking Speeds 30 to 175 oscillations. 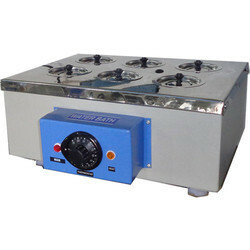 Being an Precision manufacturers and Exporters of Digital Shaking Water Baths. Our Digital Shaking Water Baths are mostly & widely used for everyday process methods in various Automated Pharmaceutical laboratories, Sophosticated Food Laboratories, Hitech Universities and for Research applications. We specialize in both standard, advanced, customized models with CE Marked, specifically designed to meet the challenging demands of various scientists / Research centers / individual and specialized research applications. Apart from that we are supplying ourTable Top Stainless Steel Water Stills & Stone Fin Water Stills in India through dealers , catering to a variety of customers ranging from Atomic energy, Biotechnology Companies, Microbiology Laboratory, Pharmaceutical Manufacturers, Defence Installations, Research Laboratories, Clinical Microbiology/Pathology/Biochemistry Laboratories, Educational Institutes and research laboratories, development laboratories, and test laboratories of leading national and multinational companies. Constant shaking speed even during heater operation. Shaking Water Baths are ideal for all applications requiring precise and reproducible results for Incubations, fermentations, homogenization, chemical and biochemical reactions, enzyme and tissue studies. Double walled, insulated, full stainless steel construction. Removable SS tray of modular design to accommodate flask holders of different capacities. Ambient Temperature 5 to 90 Degree C.
Our company is widely appreciated for offering Digital Serological Water Bath to the clients. This product is manufactured by using high quality raw material and with advanced technology. Offered range is designed and developed using outstanding quality raw materials and components that are sourced from certified client of the market. Fully stainless steel, including bottom, makes it GMP standard & total rust proof. Easy to set & use - direct digital setting & readout. Ideal for sample pre-treatement in QC, for Serological tests in Pathology and all thermostating tests. Double walled full SS construction with glasswool insulation. Gabled lid of stainless steel, specially designed so that the condensate drips on sides. A pack of float balls for containing evaporation loss. These balls will form a movable and flexible layer that facilitate easy removal and placement of test tubes, racks without the hassles of opening and closing a lid. This product is widely admired in the market for high efficiency and long life services. Offered range is manufactured from best quality raw material at our end. 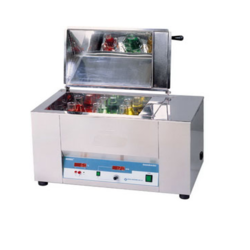 Thermostatic Acrylic Water Bath is hugely demanded in the market for its superior performance, easy operation and portability. Arcylic body for full visibility of samples. 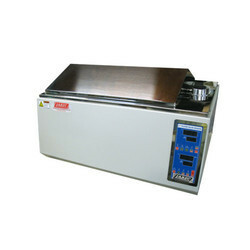 Ideal for sample pre-treatement in QC, Pathology & thermostating work upto 60°C. Double jointed Acrylic body for leak proof construction. Special design body for ± 0.5ºC control accuracy. Temperature range ambient 5°C to 60°C. Supplied with thermometer and clip. SS rust proof control panel construction. Energy efficient top suspending tubular heater. Test tube rack, Acrylic Ø20mm x 8 holes.